This article will be about some of the challenges I faced when building my new home studio project. As one can only imagine, there are a few things you may not be considering prior to starting the project. If you would take a few minutes to think through the process and the sequences involved in a project such as this you will be better prepared once you begin the actual construction. I wanted to point out some of those challenges for others to gain some advantage over what I had when I started this project and that is the reason behind this series of articles. 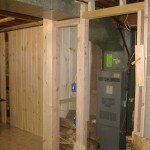 Covering up things like heating ducts, pipes for carrying the gas to the furnace, electrical conduit that for some reason just isn’t where you would like it to be, windows that are not square and the like, are all part of the many challenges you face when using wood as your primary construction material. It doesn’t bend too easily or go around corners so easily. If you do not make a correct cut, you end up having to use another board as costly as they are. I think I heard this once or twice before and I am glad I followed those instructions. Several challenges were prevented by do so, as one can imagine. So please follow the advice as it will save you money and a lot of frustration if you take on a home studio project like this one. 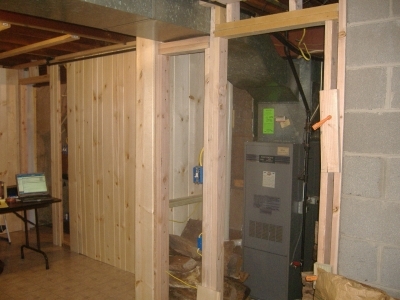 This first photo shows the heating duct work that posed the single biggest challenge and an enormous problem for me where I spent many hours just thinking about how I was going to cover up the duct work using the wood products I chose. It would have been better if I had a full length photo of the duct work as this one only shows part of the problems I had working around it. The furnace in my home had one large heating duct that ran suspended from the ceiling plane directly across the room. It was suspended below the floor joists up above by about 6″ and so I had to make a “box” surrounding it on the three sides, left, right and bottom. That meant that I had to cut a large quantity of boards to completely cover the duct. That was actually the easy part. 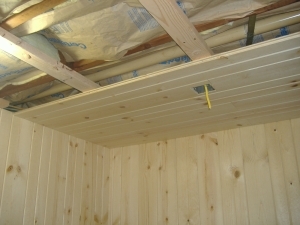 The second of the challenges was to build a frame first out of 2×2 pine wood so I could nail the outer pine panels to it since nailing into the duct was not an option. 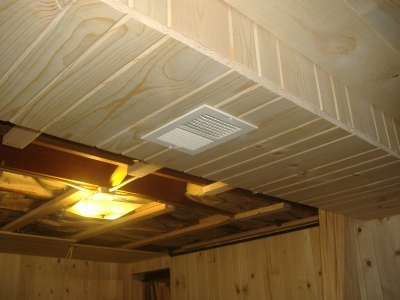 How I resolved this was to construct a pine wood a rectangular frame the length of the duct, about 8′ long. I had to make two of them so both sides were framed for the finish boards. It took a while to figure out that it was important to leave the 2×2’s hanging just below the bottom of the duct so the finish boards could be nailed to them. 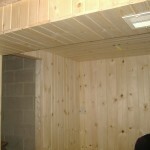 Also, they had to be nailed into the ceiling joists in order to anchor the framing solidly into place. That meant I had to manually cut all of the boards the exact same length or at least within an eighth inch. Turns out this was one of he biggest challenges. What made it so challenging was making certain that each board was cut perfectly to length and in such a way that the left side, the right side and the bottom boards met perfectly and consistently the entire length of the duct. 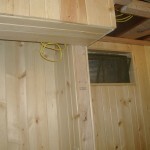 The boards ran perpendicular to the the duct and this was the only way to form the “box” surrounding the duct. If they did not align properly then the finish trim boards would not mount properly and it is likely that I would not be able to use them to give it the finished look I was going after. These two photos show what I mean. 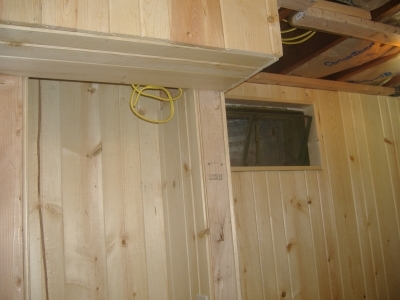 As stated above, the panel boards were mounted to a frame made of 2 x 2’s. rather than 2 x 4’s. I did this because of concerns I had over the total weight of both the framing boards and the finish boards. I thought the 2×4’s were going to weight too much. It worked out really well and as you can see. Luckily it also looks very good too. 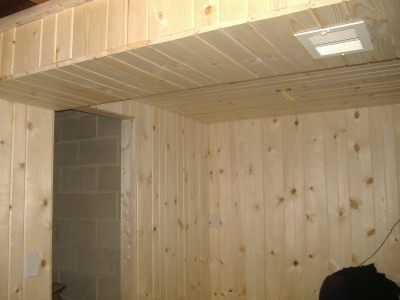 The trim boards are not shown in these photos. I’ll save that for later. Remember, each piece was cut by hand using only a standard crosscut saw made by Stanley, a small square, a pencil to mark them and a set of clamps to hold the boards in place while making the cuts. As an aside note, I did not use electric powered tools for the most part, with one exception, a DeWalt Hammer Drill. 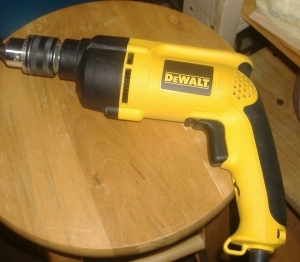 This drill was chosen for two reasons; first it provides a hammering process when drilling into masonry. I had to use it to put the holes in the cement floor and walls to secure the framing into place. It came in real handy as before I used it I was going through about one masonry drill per hole, not good economics. After I began using this drill I used one masonry bit for all of the remaining holes. The difference in cost over a standard drill is made up in the savings from using fewer masonry bits. This was a lesson I learned the hard way. The second reason was because all I had otherwise was a small, portable and inexpensive drill to work with. I was concerned that I might burn up the smaller less commercial grade of drill. When doing a major project like my home studio it is necessary and far more safe to use good tools. 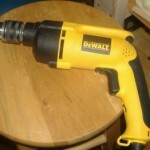 For less than $75.00 the DeWalt drill was to me a major time and cash saver in the long run. This next photo shows two additional challenges I faced in this build. The first challenge was making the cutouts in the finish wood panels for the light switches, wall sockets, the ceiling fan and the lights. 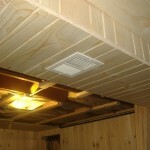 The wood panels were 5/8″ thick solid wood. The Romex wire hanging from the ceiling runs through a metal box held in place by a clamp and screws inside the box. The panel board needed to have an opening cut into it exactly where I wanted the light to go. Also, it had to be big enough to allow access to the wiring and, of coarse, so the lighting could be put up safely and securely. The problem was; I had no major construction tools to do this work. Consequently, after measuring and marking the panel board, I used my trusty DeWalt drill to make a series of holes inside the measured marks. By making these holes the majority of the waste material was removed. After that, I used a Stanley knife to trim the opening as best I could. All of this took about 20 minutes just to complete one opening as 5/8″ thick wood is difficult to cut with a Stanley knife. I had to be very careful when using the knife to prevent injuring myself. Also, I wanted the opening to be fairly clean and looking as good as possible. The finished opening is shown here and think of this, I had to do this same procedure for all of the outlets, switches and lights. There are 18 of them. The second problem I couldn’t quite figure out was how to straighten out the insulation when it was interwoven between the floor joists, the furnace exhaust pipe (the white one in the above photo), the conduit hanging below the plane of the bottom of the floor joists and the 2 x 4’s used to drop the ceiling under all of these things. What I eventually learned was, by putting the insulation into place in the general area I wanted it and then work slowly straightening it as I went along until it was finished, it made completing this process quicker. Since I did the work by myself I used whatever I could to help hold the insulation in place while securing it. Mind you, the insulation was 4′ long and 16″ thick and there were a lot of things to work around so this was not an easy thing for one person to do. Maybe you are more skilled than me but I have no construction experience making this project a major stretch for me to complete. My skills are not very good, and my ability to think and devise a method of doing things on the fly was hampered by my lack of experience doing this type of work. 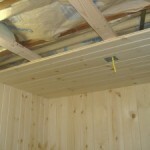 I did find that using a commercial grade small staple gun made it a lot easier when securing the insulation. Another of the challenges I faced was figuring out how to join two or more boards that were on different planes and where they were meeting together. Meaning, where different surfaces joined in multiple places and matching them up so they looked professional was for me difficult, but somehow I managed to make it work out OK. There just happened to be a window in this room:) It turned out to be right next to another “boxed in” area where the built-in bookshelf was going to go. As you can see here in this photo the panel boards needed to be cut around the window. A small challenge in and of itself. However, right next to it I had to cover another vent by creating a box around it, join it to the panel boards for the wall, join it to the ceiling boards, join it to the framing and outer panel boards and trim for the book case. Confused yet? I was. Hmmm…, now how does one do that? The only way I could figure it out was to sit and stare at it for about 25 hours or so:) All the while using my imagination in my feeble attempt at figuring this out. As I continued my journey into the construction world, I found out through hindsight that there were many things I could have done easier than I actually did them while building it. Sort of like composing your first piece of music. 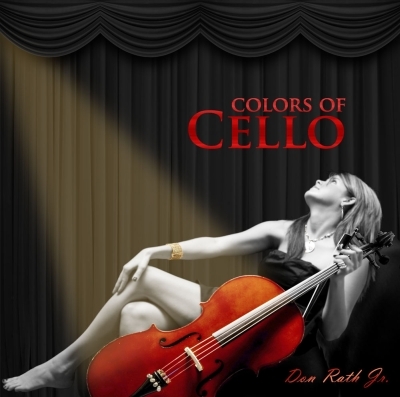 It is not necessarily your best piece and in fact, you most likely would redo most of it after several more songs were written, gaining experience all the while. I didn’t have that luxury or the experience going into this project. How was I to know there would be so many challenges in making my home studio? It was one set of challenges after the next. I didn’t know but I had to learn by diving in. What I did learn was that by taking some time to think things through I was able to make good progress and the finished project looks fantastic! In an upcoming post, the final one for this series of articles, I will provide some additional photos showing the completed room with furniture and some decorations to give you a super nice view of the finished project. 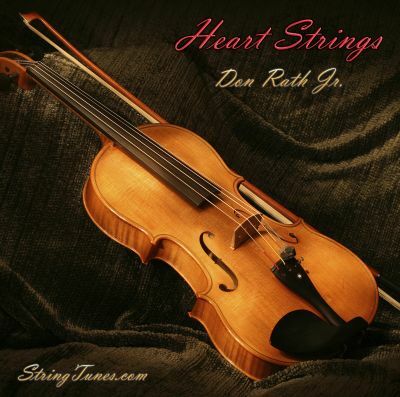 Until then, I hope you are finding some value in these posts for taking on a new home studio project even with all of the challenges you might encounter. Your project will be different of course but still, maybe my effort will provide you some insights and some ideas for your own home studio project, challenges and all.